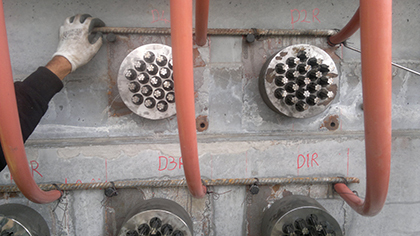 Posttensioning Systems are applied in almost every area of reinforced concrete construction including bridges, buildings and storage facilities. The posttensioning technology is based on the principle that tensile force is permanently applied to the structure after the concrete is hardened. It is applied by stretching tendons placed with high strength and suitably. The posttensioning system allows efficient use of building materials and control of deformations in operating conditions. Additionally, rock and soil ground, temporary or permanent use, application of tensioning procedure and anti corrosion protection criteria are considered especially in choice of the anchorage type to be used in ground anchors (rope and rod anchors). Mega Yapi provides the supply, application of all anchoring materials, field tests, assembly, tensioning and field surveillance services in compliance with international technical specifications for alternatives and approved in all countries requiring certification.